KINGSTON — When Andrew Nikiforuk was an editor at Equinox magazine, in Camden East, he specialized in stories about people whose plight crystalized what was happening in the bigger picture. He wrote features about First Nations groups trying to stop the damming of Alberta’s Old Man River, for example, and about the Alberta doctor who was barred from practising because he called attention to increased cancer cases downstream from the tar sands. He continued crusading with his books. In 2002, he wrote Saboteurs, the story of Wiebo Ludwig, the Alberta farmer who was charged with sabotaging oil wells when sour gas in his area was found to be causing stillbirths. And in Tar Sands, Andrew drew the world’s attention to the catastrophic effects of using river water to extracting dirty oil from the Alberta ground. 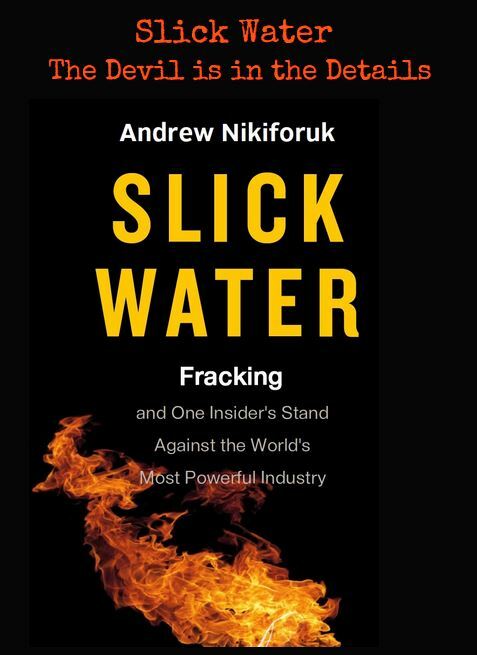 Now he has written Slick Water: Fracking and One Insider’s Stand Against the World’s Most Powerful Industry. The insider in question is Jessica Ernst, who has launched a $33-million lawsuit against a major oil producer, Encana, the Alberta government and the Alberta Energy Regulator. Ernst, an environmental scientist living near Rosebud, Alta., claims that massive hydraulic fracturing, or fracking, that Encana has conducted in its wells in her area has released poisonous gases into the region’s aquifers, poisoning her well water. Fracking is the practice of pumping high-pressure liquid chemicals into an oil or gas well in order to fracture the rock around the well and thus release more oil or gas. The practice has been around for a long time: oil companies in Pennsylvania in the [1860s] dropped nitroglycerine-filled “torpedos” down their unproductive wells, with mixed results. Sometimes the wells produced more oil, sometimes nothing happened, and sometimes the rock fractured so much that oil leaked into nearby wells and aquifers. Little has changed since then. Fracking has been banned in most European countries as well as in two Canadian provinces: Newfoundland and Quebec. In Alberta, however, more than 171,000 oil wells have been fracked. Virtually all of the oil now being produced in Alberta comes from such unconventional practises as fracking. And there are plans afoot to begin fracking in southwestern Ontario and the Atlantic provinces. Before [and after] she launched her suit, Ernst worked as a consultant for the oil industry, helping clients clear environmental regulations in order to carry out their business. 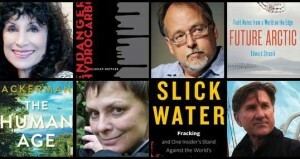 … Part of her suit is the contention that the close relationship between Big Oil and the former provincial government has violated the public interest: in response, the regulatory board, which is supposed to prevent the oil industry from harming the public, has accused her of breaking into offices, altering documents, and even of ecoterrorism. Andrew’s book is his fourth, since Saboteurs, about the Alberta oil and gas industry. Taken together, they form a powerful indictment, not only against the methods now required to extract Alberta’s reluctant oil, but more importantly against the silence the provincial and federal governments have imposed on public protest against documented pollution and contamination, increased rates of cancer, and other public ills. Early in Slick Water, Andrew cites French technology philosopher Jacques Ellul, whose book The Technological Society changed the way we have to think about the systems and the people we allow to control our lives. That, according to Andrew, is the paradigm in which Jessica Ernst is trapped. To question the right of Big Oil to poison and then silence the general public is considered to be a criminal act, at least in Alberta, at least under the Conservatives. Have things changed with a new provincial government in power? Andrew will share the stage at Kingston WritersFest with Diane Ackerman and Ed Struzik on Sept. 26, The event, called “Big Idea: Think Tank on the Environment,” will be hosted by Carol Off, and is sure to be one of the most stimulating, and sobering, events of the year.